Prosperous Entrepreneur- Marketing and Success for Advisors: The Big Three Auto Makers – Should They Stay or Should They Go? The Big Three Auto Makers – Should They Stay or Should They Go? I believe that the Free Market works. Plain and simple. Anyone heard of the Edsel? The huge 1957 Ford failure? Ford designed and built the Edsel under intense secrecy and based the design on what was popular at the time, never asking focus groups what they wanted. When you base your entire sales projections on cars people bought in the past, it’s no surprise that you will not have a big winner on your hands. That’s exactly what’s happening now. Times starting changing many years ago, but the big three auto makers continued to base their design and manufacturing on the past. 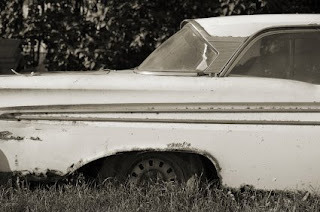 As a result of little demand, the Edsel died. The Free Market killed it. Another way of looking at the situation is: Do we really need a new car every four to five years or are the big three creating demand for their products through creative financing and advertising in order to push their gas guzzlers out the door? In a way I pity the big three. They are weighted down by union demands. Did you know that Toyota pays its workers a similar hourly wage as the big three? Only Toyota is free from union limitations on job descriptions. Workers’ are free to transfer from screwing bolts on dashboards to attaching doors and windows, which is not the case elsewhere. The big three have far too much overhead to make a profit, let alone to invest in new, cutting edge design and fuel economy. Let the free market take care of them. The big lesson for us here is: create products and services that consumers want and need.